There are many companies that offer exterior window cleaning, but most often they charge prices up to TWICE as much as ours. Have us perform this service for you, and pay much less. Receive the same high quality service that you would expect from the large, high-priced businesses in the industry, but pay a fraction of the price! Most well known window cleaning companies charge between $150 and $270 for this service! We charge much less for what we would argue is an even BETTER service than our competitors, which is why our services are quickly becoming highly demanded. 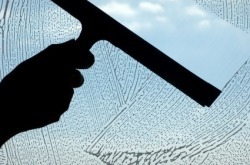 You can finally have your windows professionally cleaned without emptying your wallet! Our prices average just $90 for your entire home. Smaller homes usually cost around $70 - $90, with larger homes generally priced around $120 - $160. Dirt accumulates quickly on all the windows of your house, and the slow progression from clean to filthy windows may not be too easily noticeable until you have them cleaned. Having your windows cleaned will have a drastic impact on the overall appearance of your house from both outside and inside, and will increase the amount of sunlight that enters your home.